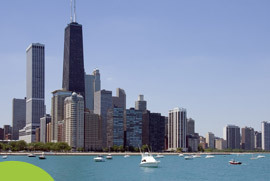 Welcome to Chicago airport ground transportation portal - We provide information about transfers services from or to O'Hare and Midway airports: Train, taxis, shuttles, limousines and private car hire services, ... 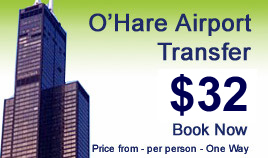 Explore the options in the list below to find out which method of getting to O'Hare or Midway is best for you. Our website also features a city guide including a selection of things to do and places to see (Prominent tourist attractions and popular places) not to be missed. About airport shuttle online reservation: Transfer must be booked at least 24 hours in advance of your travel date. All drivers have completed the National Safety Council's defensive driving course. Service is operated by Airport express. Also see Omega Shuttle services.